The Nintendo Games Seminar is an annual program where teams of college students are given weekly classes on game development from Nintendo. Over the course of eight months, the groups design and build their own game. And now, last year’s four games are available for free on the Japanese Wii U’s eShop. The first game is Poppo Hunter. In it you play matchmaker for your recently dumped pigeon friend. Thus you go to the park with a bag of seeds and toss them at the pigeons to help him find his ideal mate. The game uses both the gamepad and a Wiimote/Nunchuck combo. You place the Wii U gamepad at your feet and then use the Wiimote to chuck seeds to the birds. As you feed the birds, they get happier and happier until one approaches you and appears on the gamepad. Then, when it is eating the seeds on the gamepad at your feet, you bring the Wiimote and Nunchuck together to grab the bird and see how your pigeon friend rates her as a perspective mate. The second game is called Center Heroes. It is a multiplayer game with up to five players battling it out to get the best picture taken. In the game arena, a camera-style crosshair appears. When the picture is taken, the closest person to the center of the frame gets the most points. But of course, you don’t want anyone else to get points at all, if you can help it; so you are constantly trying to push everyone out of the picture before it is taken. The third game is called Shima Nagame (Island Viewing). In this game, you play a god-like character looking down on an island with a single inhabitant, Cloud. You do not control Cloud, rather she wanders around aimlessly looking for the stars that have fallen on the island. To help her, you can drop apples (her favorite food) to get her to move to an area of your choice; sticks, to help her cross rivers or hit out-of-reach objects; and banana peels, to help her fall into places she wouldn’t normally go. The fourth and final game is Sentou Danchi (Battle Ground Estate). Simply put, it is a tower defense game—only a side-view one. You play as a group of astronauts trying to repair their rocket and escape a dangerous world. During the day, your astronauts head out and gather metal blocks of various shapes; you use those shapes to build rooms. When a room is sealed off from the outside, you can take the escape pods that are constantly falling from the sky and put them in the room—letting out the astronauts inside to bolster your forces. Then, at night, the planet’s hostile alien life comes to attack your base in hopes of destroying your rocket. Your astronauts hide in their rooms and shoot at the aliens. However, if a room is exposed to the outside, the inhabitants instantly die—and if the rocket is destroyed, it’s game over. Of the four games, Sentou Danchi is by far the most enjoyable and complex, although I’m sure Center Heroes would be a great short time waster with you and four of your friends. Poppo Hunter, on the other hand, is just weird and often hard to control; and while the idea behind Shima Nagame is decent, it is both ponderously slow and finishes too quickly as it takes less than 20 minutes to beat..
Nintendo is taking applications until June 29, 2014, for this year’s Nintendo Games Seminar from college students in the Tokyo and Kansai regions. If you fit the bill and have a high level of Japanese, click here for more information on how to apply. 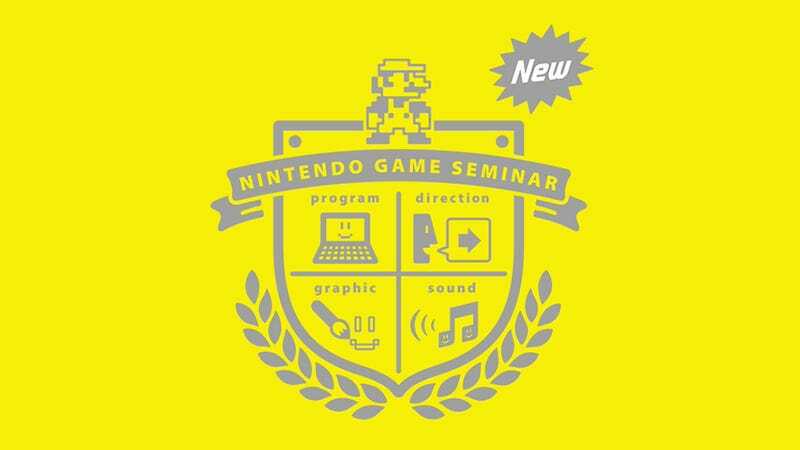 Nintendo Games Seminar 2013 was released for the Wii U on June 18, 2014, in Japan and is currently available for free on the Japanese Wii U eStore. There is currently no word on a Western release.